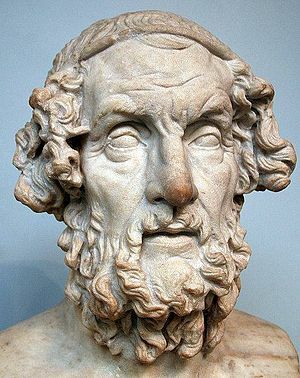 The Iliad is an epic poem widely believed to have been written by Homer, the legendary Greek rhapsode, in the 8th century B.C. The poem details the legendary Trojan War (Ilium being the Latin name of Troy) and the in-fighting of many Ancient Greek mythological heroes. Traditionally, the siege of Troy is believed to have taken place in 1184 B.C. The Iliad was revered by Greeks and all who followed in the Greek legacy, attempting to emulate it. It received something on the order of Biblical significance by later Greeks, seeking to define the prime values of their culture - honor, and valor. Alexander the Great is said to have slept with a copy of the Iliad under his bed, and claimed to be a descendant of the Greek warrior Achilles. Along with the Odyssey, which primarily recounts events that took place after the Trojan War, the Iliad is one of the two main ancient Greek epic poems. Modern readers seeking an account of the Trojan War may be surprised to find that the most famous episode - the Trojan Horse - does not feature in the Iliad at all. Instead the poem concentrates on the in-fighting between the rival Greek kings Achilles and Agammemnon. Was the Iliad written by one man (the alleged Homer), or by many people over generations? Were some portions of the Iliad written before others? To what extent are the characters in the Iliad based on historical figures? At one time it was supposed that the story had little or no historical basis, but the discovery of what appear to be the ruins of Troy by Heinrich Schliemann in 1868 suggests that the recounted events may be least partially factual. This page was last modified on 14 September 2018, at 17:55. This page has been accessed 14,743 times.